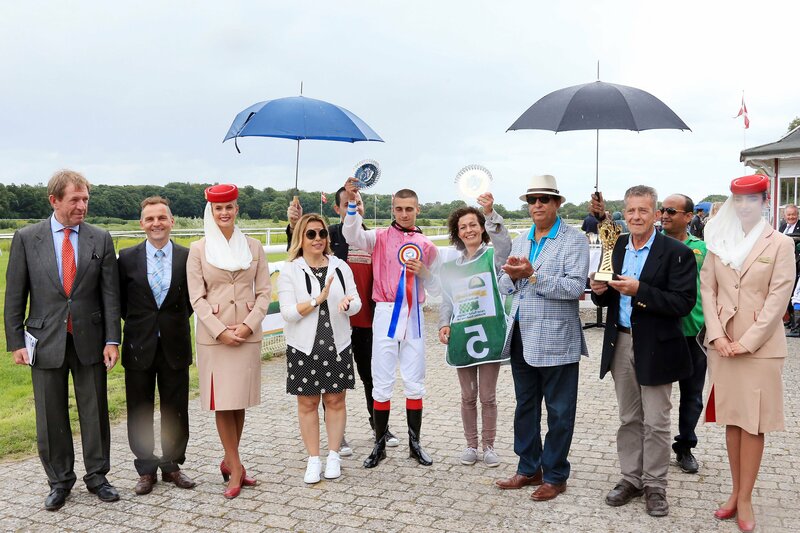 7 August 2016, Copenhagen ~ Nine-year-old Sartejano carried Italian Apprentice jockey Daniel Scipioni to a superb win in the HH Sheikh Mansoor Bin Zayed Al Nahyan Global Arabian Horse Flat Racing Festival’s HH Sheikha Fatima Bint Mubarak Apprentice World Championship race at the Klampenborg Racecourse, in Copenhagen, Denmark, on Saturday, 6 August. It was a sizzling display on a rainy day by the 20-year-old Italian as he rode the former veteran star from Diana Dorenburg’s yard to a great win in the 7-furlong contest which was watched by nearly 30,000 fans. Sartejano, a son of Dormane, had been a champion runner and won the European bonus of Euros 30,000 in the Festival’s 2011 Sheikh Zayed Bin Sultan Al Nahyan Cup. 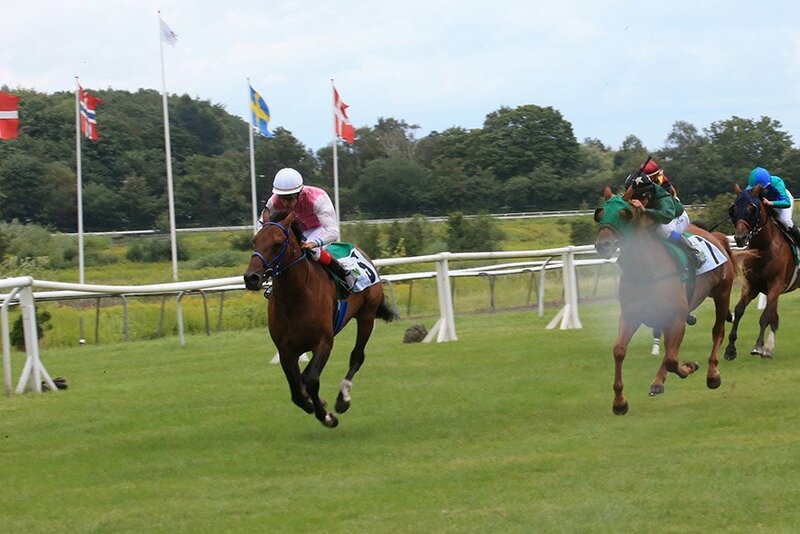 With just one win in 2015, Sartejano was not one of the favorites going into the race, but the Italian Scipioni seized a gap as they turned for home and battled away with Mad Makz under Fanny Olsson making a determined bid on the outside. Sartejano had enough to steer clear of the Swedish raider, also besting the pre-race favorite Athlete Del Sol under British Apprentice Rhiain Ingram that ended in third place. The winner took 1.33 minutes to land the win and now Scipioni qualifies for the final in Abu Dhabi on 6 November. “I am very happy. This is only my fourth career win and I only got a license to race earlier this year,” said the Italian who has ridden in 24 races so far. Frankie Dettori is the man that Scipioni idolizes and the Italian said he is looking forward to the trip to Abu Dhabi. HE Sultan Rashid AlKaitoob, the UAE Ambassador to Sweden, Denmark and Finland along with Ms Lara Sawaya, Executive Director of the HH Sheikh Mansoor Bin Zayed Al Nahyan Global Arabian Horse Flat Racing Festival, Chairperson of the International Federation of Horse Racing Academies (IFHRA), Chairperson of Ladies & Apprentice Racing Committees in the International Federation of Arabian Horse Racing Authorities (IFAHR) attended the prize distribution ceremony. “6 August is the anniversary of the accession as Ruler of Abu Dhabi of the late Sheikh Zayed Bin Sultan Al Nahyan and this big race being held here is quite appropriate as Sheikh Zayed was one of the main promoters of Purebred Arabian racing. We are proud to stage this race here in Denmark and I thank HH Sheikh Mansoor Bin Zayed Al Nahyan, Deputy Prime Minister and Minister of Presidential Affairs for his support to Arabian racing,” said HE AlKaitoob.